For years I've sensed sacred grids or "etheric pyramid complexes" in South America, but never realized it would involve star systems. I will ask you to recall the triangle extending from the throat of the magnificent Archangel in Oregon, which was the beginning point to the ancient route down to Peru yes? Note the brightest star Sirius is the throat star of Canis Major. So actually this route is from the Archangels throat chakra to Sirius' throat chakra via either the Tiahuanacu Gate or The Temple of the Sun and Moon! It was an amazing feeling to be sure. So we have the ancient route flowing down through Messier 50 right into the Tiwanaku Gate, flowing directly into Sirius itself through the throat center of Canis Major. I have no doubts the Ancients knew this. After I marked the Sirius star system in Peru I went back to the stars that fell on land to determine if anything was there of significance. When I got to the crown star of Sirius I found a huge diagram of a fish. It is 160 feet in length and 89 feet wide. It looks like it is in the middle of a desert region near a couple villages called Relave and Mollehuaca, where they mine gold. It also looks like there might be some letters or design in the middle of the fish. Hence, it might be of recent origin, but the fantastic aspect to this fish is the location being centered in direct alignment with the top of head/crown of Sirius where the blue lines are cornered. Even if it is modern.........Who put it there? Why did they put it there in that specific spot? Did they know it aligned with Sirius' crown or head? How did they make it so perfect at a 160 feet long and 89 feet wide? Below is the negative showing the possible letters better. 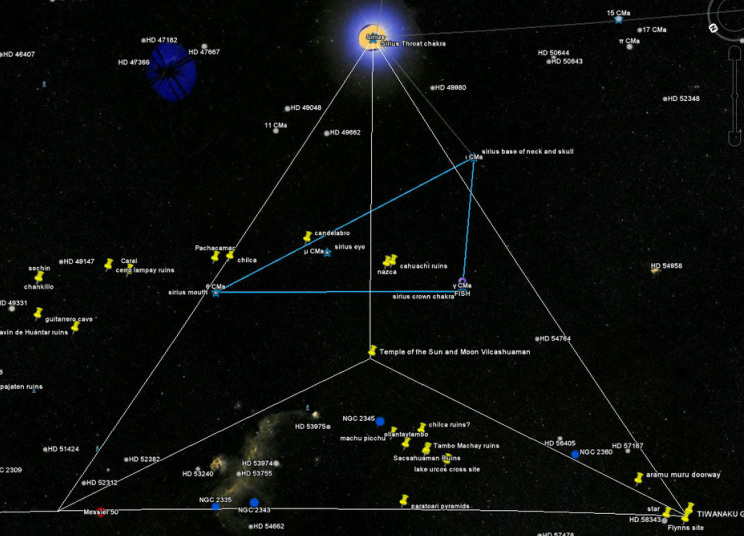 Below is a closeup of the Sirius complex on the starmap with Sirius' head in the center. From the center of the sacred grid, the Temple of the Sun and Moon, the center rod or pole goes through the Nazca lines into the gate of Sirius' head. As I measured the lines creating the Sacred Grid, I noticed the inner lines of the tetrahedron were 180 miles. I realized it was half of a circle and by doing so I realized I was actually looking at a full pyramid. Notice in the image below, Sirius' head and the tetrahedron creates it's own little pyramid in the bottom right corner. The Sirius complex is aligned both North and Northwest. When I came upon finding the Angel in Oregon I wondered why she was facing North, but the ancient route was Southeast. I also wondered why so many faces were looking Southeast. Are the Faces guiding us to focus on the ancient route down through the America's leading us through the sacred grids and their constellations along the way? Below Sirius' head is facing in the NW direction, in alignment with the ancient route up to the Angel......It is also interesting to note that the fantastic ancient cities in the center of the Pyramid Temple seemed to be aligned to the center at the Temple of the Sun and Moon and the coastal ancient pyramid cities are aligned with Sirius' pyramid/head. Below is Sirius' pyramid within a pyramid sacred grid. Note the opposite location to the Galactic Center is in the red triangle, which would fall land wise in the Pacific Ocean off the coast of Peru. We have Oregon/Pacific Northwest aligned in Perseus, Four Corners/Mexcio in Pleiades/Taurus and Auriga, Central America in Orion and Peru in Sirius. I'm thinking this is a very nice route indeed. This opposite sacred grid to Peru/Sirius is off the coast of Java and Sumatra. It is very close to some magnificent ancient temples in Java and not too far from the isle of Flores, where they found remains of the "Hobbit". As you can see the Sumatra/Java sacred grid falls very close to Sagittarius and the center of the Milky Way (red triangle) to the right of Sagittarius.